It is with tremendous sadness that I write to tell you about the death of long-time, very devoted, CCHCC activist and member, Eleanor Clifton. Eleanor Clifton died on Wednesday of this week. She had been sick with cancer for several months. The obituary for Eleanor is in today’s News-Gazette here. Many of you knew Eleanor because of her active involvement in CCHCC’s task forces and community organizing efforts. She was an active member of the Friends of Public Health Coalition, which passed the voter referendum in 1996, creating the Champaign County Public Health Department. Eleanor was also active with CCHCC’s Health Care Access Task Force and our Medicare Task Force. 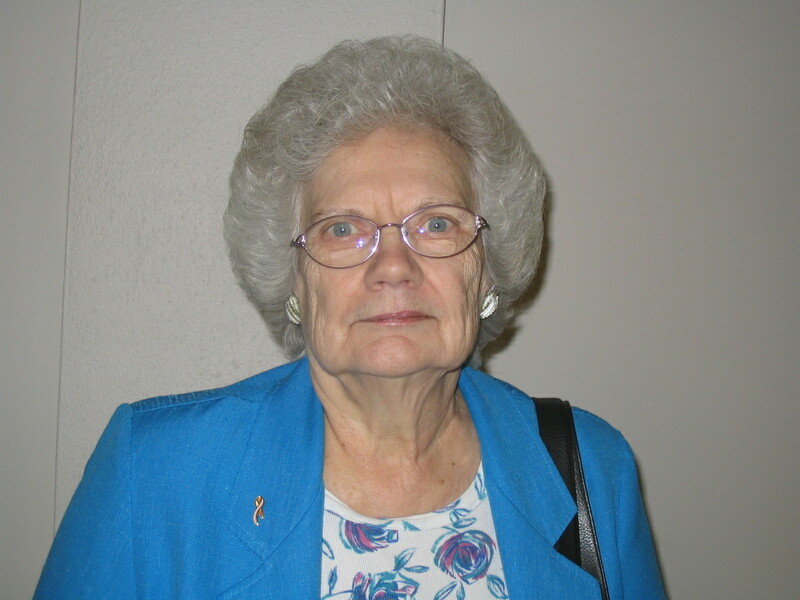 CCHCC honored Eleanor with the Harry J. Baker Community Service Award in 2009 for all her activism. I first met Eleanor in 1995, when I, too, was a volunteer for CCHCC, working with the Friends of Public Health. I have been honored to work with Eleanor for all the years since, and to know her as a dedicated activist and devoted friend. As an activist, Eleanor was quiet, courageous, dedicated and hard-working. 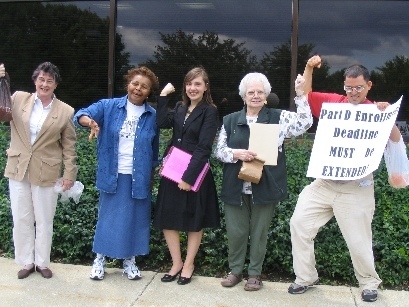 She would show up to protests and hold signs, as well as do the hard quiet work of talking to people one-on-one, gaining their support on whatever she was working on — whether it was gathering petition signatures, or asking people to sign a letter to a legislator, or getting organizations in Rantoul to formally endorse an effort that CCHCC was undertaking. Eleanor would show up to meetings — whether Friends of Public Health or Medicare Task Force — and quietly turn in to staff dozens of signed petitions or sign-on forms, never making a fuss about it. Sometimes, we did not even know that Eleanor had been out there pounding the pavement, gathering support by having one-on-one conversations. One day, she came into a Medicare Task Force meeting and delivered a sign-on form with the Mayor of Rantoul’s signature! It was a sign-on form for a Medicare Part D effort we were organizing, and we delivered the form (among others) to Rep. Tim Johnson. Eleanor could be counted on to attend meetings with Sen. Durbin, Rep. Tim Johnson, or anyone else we needed to meet with. She always represented our cause with quiet and righteous dignity, and you could not help but be moved by her sincerity, her caring, and her conviction. I am not exaggerating when I say that Eleanor is one of the kindest, most caring people I have ever known. I think that anyone who knows Eleanor will agree. Eleanor’s whole entire being was devoted to caring for others. Her profession — nursing — was devoted to caring. The work she did with and for CCHCC was motivated by a deep caring for other people; a desire to eliminate suffering and to create the possibility for health and healing and well-being. Though she was a tremendous activist, Eleanor was not a stereotypical “radical.” She really didn’t speak much about politics. She was focused and pragmatic, always doing what she thought was the right thing. And I think that it was her deep caring that allowed her to be so persuasive to the hundreds, or probably thousands (over the years) of people who signed on to the numerous things that she asked of them — if Eleanor was asking you to do something, you knew it was simply the right thing to do. Because that’s the kind of person she was. When we were working on the public health campaign, people told us we could not get support from rural Republican voters for establishing a county-wide public health department. Yet, meeting after meeting, Eleanor returned with signed petitions that included lots and lots of signatures from Republican voters from the Rantoul area. To me, that was testament to Eleanor’s goodness — if she asked you for something, you would do it, because you knew it was the right thing to do, because Eleanor was asking you. Her heart was always only motivated by love and caring. So many of us will miss Eleanor tremendously. We have lost a loving and devoted friend. A true friend, full of grace. On behalf of Champaign County Health Care Consumers, I want to extend our deepest most heartfelt sympathies to Eleanor’s family and community members, and to all of you, Eleanor’s CCHCC family members. We have been blessed and honored to know Eleanor, and we will miss her tremendously.